For the first time since she’d entered the room, Edie looked uncomfortable. She took a hasty sip of the spiked tea, probably to fortify herself. Alec wasn’t surprised she’d gotten herself into trouble. As far as he was concerned, she was an accident waiting to happen. But it startled him to hear that Lady Reese was unhappy with her. The woman adored her daughter and, according to Wolf, was convinced that Edie could do no wrong. There was that faint wash of pink again. This time, though, Alec wasn’t charmed. The idea of Edie getting into trouble with a man had him clenching a fist against his thigh. “Who was he?” he asked sharply when she remained silent. Edie set her teacup down on his desk with a loud click. Then she crossed her arms over her impressive bosom and gave him an ironic stare. That she was silently but clearly commenting on his reputation as a rake did not improve Alec’s mood. Yes, he liked women, but he never tampered with virgins or innocents. Alec closed his eyes, trying to ignore the fury turning his vision blood red. When he opened them, she was eyeing him like he was the one who’d lost touch with reality. And perhaps he had. The notion of Edie in another man’s arms made him want to commit several acts of mayhem. “Did he hurt you?” he growled. Her naïveté and reckless self-confidence bordered on criminal. Still, there was little to be gained in pursuing that point. The sooner he got the image of Edie in Bannister’s lecherous embrace out of his head, the better. “Imagine my surprise. And yet, your parents want you to rusticate. To Maywood Manor, I assume?” But what did any of this have to do with him? She pressed her full lips into a grim line. “Miss Whitney?” he prompted when she remained silent. 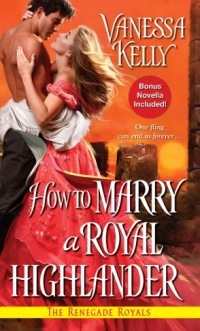 Thank you so much for hosting HOW TO MARRY A ROYAL HIGHLANDER! Good morning, Vanessa, and welcome to Karen’s Killer Book Bench! Like Jan K, I can’t get enough Highlanders either. I think I could learn to swoon just so one can catch me! 🙂 Can’t wait to read this book!